This one, this one, this one! This is the one that’s going to come the closest to getting 10’s across the board. A wonderful harmony of bitter sweet dark chocolate and crunchy goodness. Keeping in mind some bars are supposed to be smooth and some bars are meant to be textured out of the wazoo, this bar falls smack in the latter category. This chocolate provides a satisfying and dare I say aggressive crunch in every single bite. It’s unlikely you’ve experienced this kind of crunch in any other chocolate bar. Sure some bars contain nuts, puffed rice, or even potato chips but their crunch is found wanting in the presence of this glorious work of culinary genius. Golly is it good, so good! When I tell friends about this bar I find my self gushing in the manner of a 90’s tween discussing the latest frosted tipped hair, white jeans sporting, indoor sunglasses wearing, boy band sensation. Its dark and dry with a fine red wine paired with an in-you-face unapologetic crunch. From the graphic art of a mountain biker catching mad air (so much air) to the crunch, crunch, crunch (did I mention the crunch yet?) Its great all around. The taste is the strong dark but not overly bitter taste one would come to expect from an 80% cocoa and the unexpected crunch from the inclusion of raw cocoa nibs. From the manufacture ” A dark chocolate experience to the extreme. 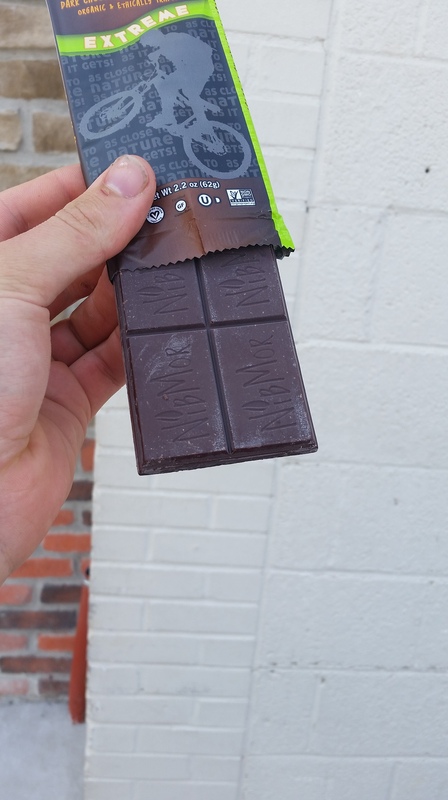 This bar combines added antioxidant power with the crunch of cacao nibs. 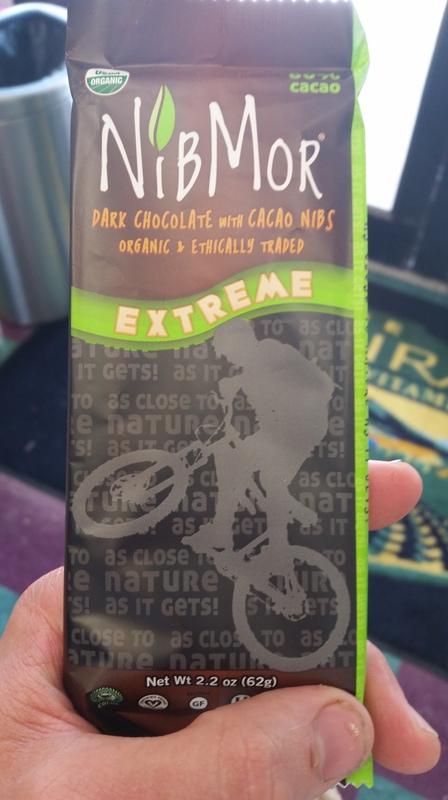 Ingredients: INGREDIENTS Organic Cacao, Organic Cane Sugar, Organic Cacao Butter, Organic Cacao Nibs, Organic Non-GMO Soy Lecithin (an emulsifier), Organic Vanilla, , Nutrition Facts: , , *Allergen Statement: Created in a facility that handles milk, peanuts, tree nuts, soy and wheat. Allergen Information: Gluten free. Dairy free. Vegan. Warning Information: Created in a facility that handles milk, peanuts, tree nuts, soy and wheat. Summary: … cases of 12 are available. http://www.abesmarket.com/natural-products/food-and-drink/chocolate/natural-organic-chocolate-bars/extreme-80-dark-chocolate-bar-with-cocoa-nibs-12-pack-2-2-oz-ea.html and my half birthday is coming up. P.S. Yes I know they’ve changed their package design and I’m slightly disappointing but not enough to write a strongly worded letter or to stop eating these delicious chocolates.